Recently, the Hog Roast Ambleside were hired by Calley and Val to cater a fantastic wedding reception which was being held at their own local pub. The venue was at the Queens Head Inn and Restaurant in Ambleside. As the couple owned the pub, their provided their own crockery and cutlery and provided their own waiting staff and bar staff. They only required a small team to cook, carve and serve the Hog Roast to their guests. They selected a menu from the selection offered to wedding parties and choose a selection of five canapes for their waiting staff to serve to their guests on arrival. These included Dim Sum, Scottish smoked salmon, chicken satay, mini quiches and handcrafted duck wraps. 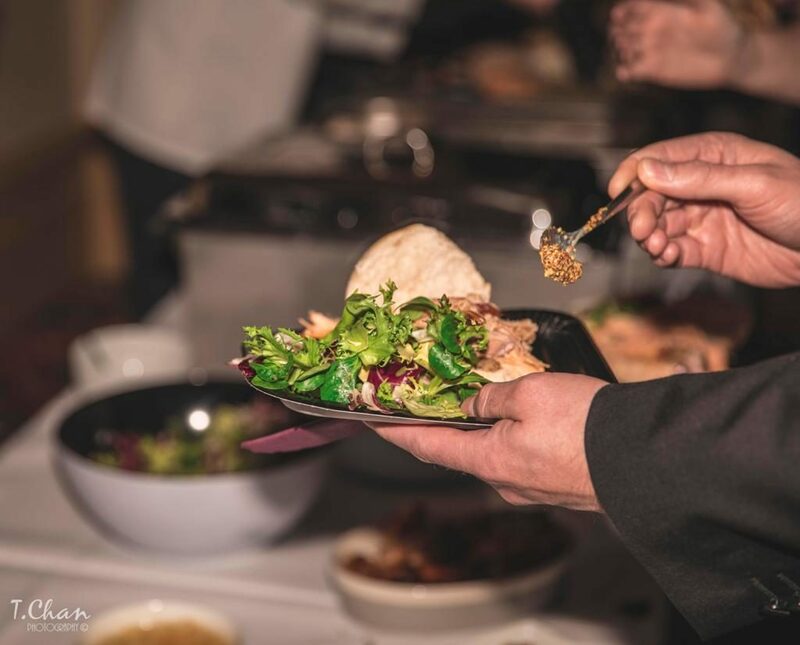 Their main course was to he served at 7:30pm and the Hog Roast Ambleside team ensured that they met this deadline to ensure that their food fit into the tight schedule of a wedding. The main course consisted of a traditional slow roasted hog, cooked to perfection on site in one of the team’s Hog Master machines. The delicious hog meat was served with crispy crackling, homemade stuffing and classic apple sauce. As an alternative option, the Hog Roast Ambleside team crafted some beautiful lightly grilled vegetable and halloumi skewers. A selection of side dishes were also served alongside the two main options including tomato and mozzarella salad, roast potatoes, pasta salad, coleslaw and potato wedges. The Hog Roast team ensured that they made enough food for all of the couple’s 80 wedding guests. The Hog Roast Ambleside team’s Catering Manager, James, ensured that the team worked hard to deliver an excellent service at Calley and Val’s wedding. Their bar staff served plenty of drinks and helped to get the reception off to a fantastic start with the serving of their canapes. The guests had a great time and it was a fantastic decision to hold the reception at their own venue. Everyone really enjoyed the food and the buffet went down fantastically with the wedding guests. It was definitely a night that Calley and Val will remember and treasure for the rest of their lives. Outdoor Cinema Screening Topped Off With A Hog Roast!